As we travel to work with coaches and athletes across the globe, our team makes more connections with respected pioneers in the running and triathlon industry. We are thrilled to announce our most recent sponsorship with Dotsie Bausch, an Olympian and silver medalist of the London 2012 Olympic Games. Dotsie Bausch enjoyed an illustrious career as an endurance athlete and now serves as a personal coach and mentor to athletes. Her post-retirement life includes advocacy for eating disorder awareness, research, and treatment as well as professional ties to technology and health industries. Dotsie Bausch is an incredible ambassador for our products and technology and we are very excited to announce her sponsorship with the RPM² team. A native of Kentucky, Dotsie launched a thriving personal coaching business in 2002. During its early inception, she primarily worked with female athletes but since her business has grown substantially, Dotsie works with male athletes, too. She relies heavily on personalized training programs to achieve results for her clients and she takes an approach to coaching that incorporates a balance between the mind and body. 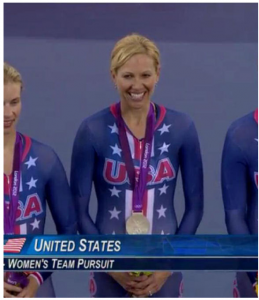 As an athlete, Dotsie earned seven US National Championships and two Pan American gold medals in addition to her silver medal from the 2012 Olympics. Her journey to competing in the Olympics was featured in a documentary titled Personal Gold, which premiered in global film festivals in 2015. She currently serves on the executive board for the Women’s Cycling Association and as a mentor for the Network for Advancing Athletes. To stay up to date with the latest RPM² news, subscribe to our blog by entering your e-mail address into the subscription box on the right side of this page. Feel free to follow us on Twitter and Facebook, too!